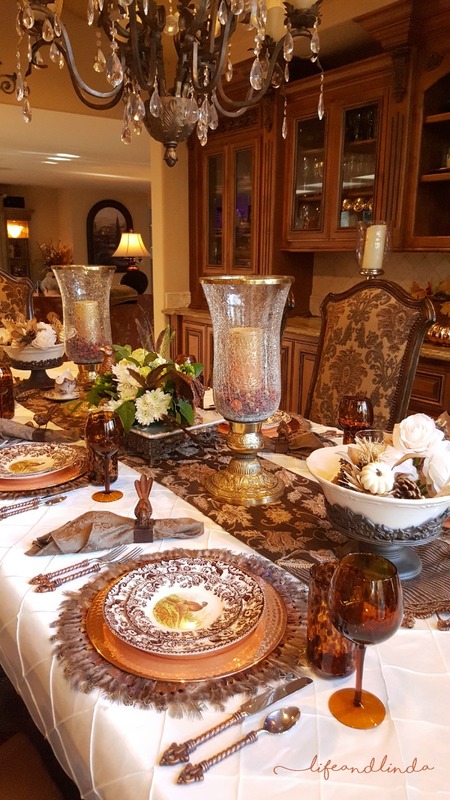 Welcome to another Thanksgiving Tablescape Blog Hop. I love sharing the inspiration from these lovely designers. I hope you get inspired. Many thanks to our gracious host, Chloe from Celebrate and Decorate for organizing these very fun hops. We have shared tables for almost every holiday. Do enjoy! The Breakfast room is all decked out with a forest friends theme. Rich warm fall colors dress our room. My inspiration for this theme are these cute animal plates from Ross. I could not resist buying them for a bargain price. They are all different. I also want to point out the darling little wire pumpkin place card holders my friend Liz- Home and Gardening With Liz bought me. She sent me a picture of them on a text. She said she was at Michaels's shopping and saw them on sale. I checked online and couldn't find them. She graciously sent them to me as a gift. These very sweet faces are adorned with beautiful Autumn colors. The squirrel is so cute, although those little critters were eating our flowers this summer. I loved watching the sweet little babies. 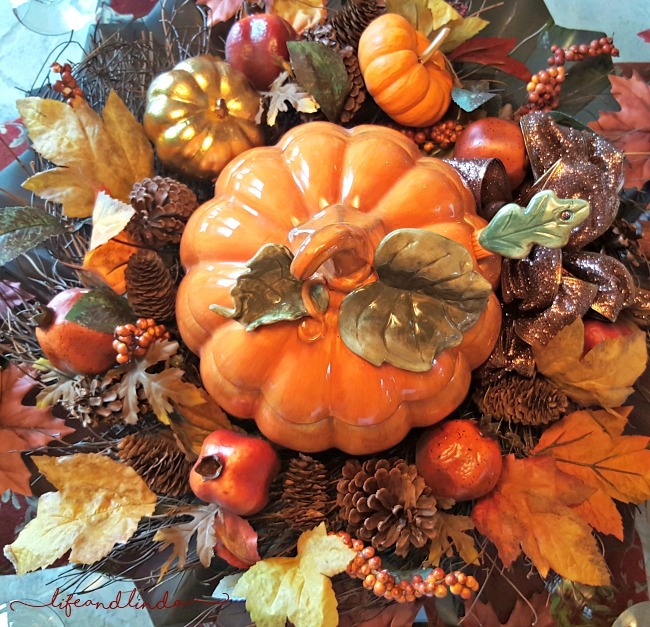 My pumpkin tureen is the centerpiece surrounded by a colorful Autumn wreath. I enjoy dressing our chandeliers. 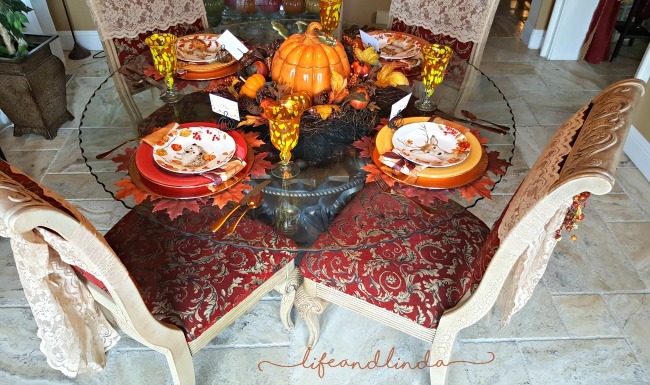 If you missed my other Thanksgiving table I posted last week, you can see it below. Thanksgiving With Pheasants & Quail. I love this sweet cake. I did not have time to make it, but I wanted to share it. It blends well with my Forest Friends. This cake is from Woman Day magazine. Thank you for your visit. I wish you all a beautiful Thanksgiving. 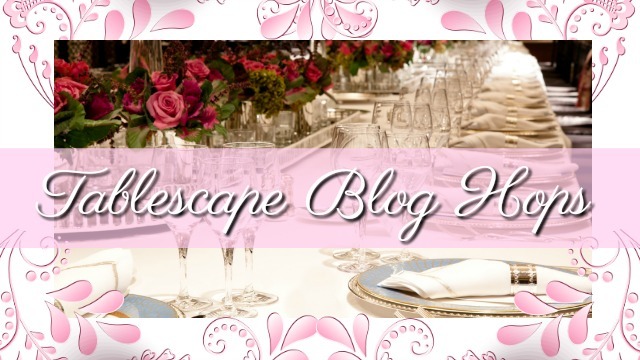 Be sure to visit each designer's tablescape below. What a sweet gathering of forest friends for Thanksgiving. The rich colors of the fall leaves beneath your plates is lush and perfect for the season. I love how you have nested the pumpkin in the grapevine for your centerpiece. 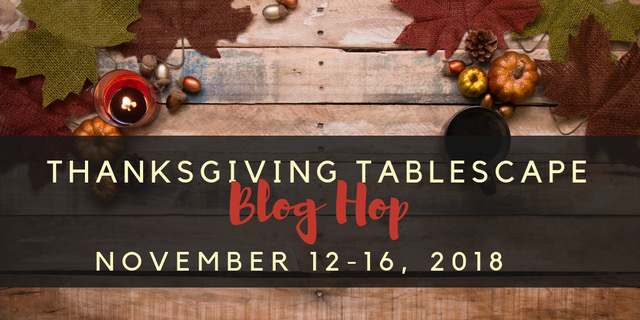 Thank you for being a part of another blog hop, at this season, I am thankful to have such great blogging friends like you! 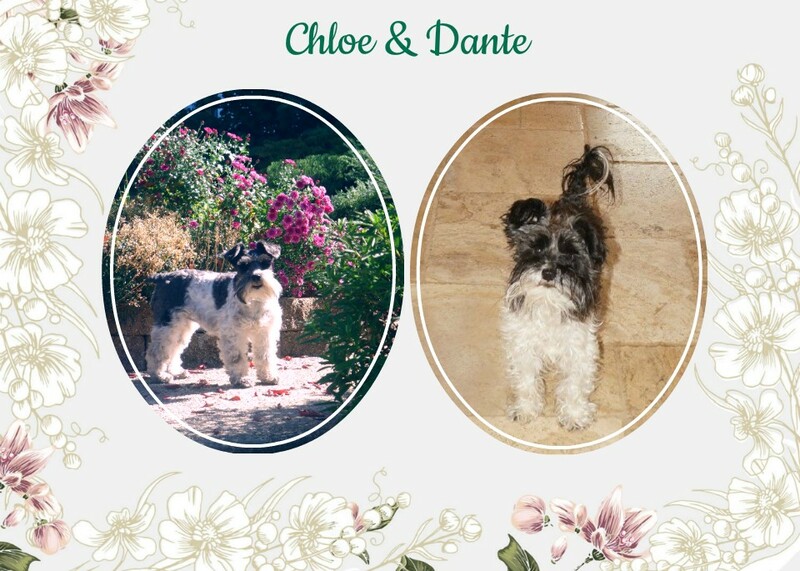 Thanks so much Chloe, it has been great fun blog hopping with you. Many thanks for organizing these fun hops. I cannot wait to see all of the lovely Christmas tables. Cute assembly, Linda. I like the casual tone in your breakfast room. Here's hoping you're far enough north and central in CA to not be impacted by air quality, not to mention the devastating fire. Thank you Rita. Sometimes casual is perfect. We are safe. We are experiencing the smoke. I feel so bad for those who lost their lives and some who lost their homes. Practically the whole town of Paradise has burned. Good news. Several of my purse collecting friends and their families have been impacted. Those plates are adorable! What a cute find. Perfect for your breakfast room too. I've been thinking of you with the terrible fires. Hope you and family are ok? Thanks Debbee. I could not resist those cute little faces. Thank you for thinking of me. We are fine. The fire is about an hour and half from us. 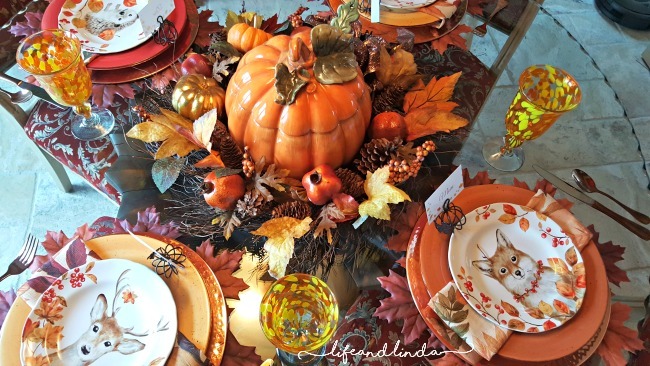 I love your tureen wreathed in autumn beauty as a centerpiece for your table Linda! 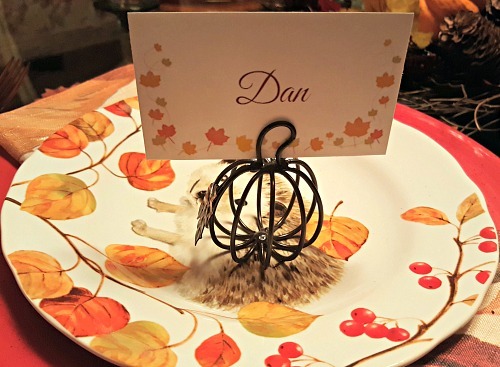 Your pumpkin place card holders from Liz are a fun fall or Thanksgiving addition to any table. Your woodland creatures are adorable although I have a love/hate relationship with the squirrels...they’ve chewed our house and our boat! Love the shot of your ceiling with your decorated chandy. It’s painted the perfect color for the season. I always enjoy blog hopping with you. Happy Thanksgiving! Hi Mary, the tureen surrounded by the wreath is obviously a hit. I love using wreaths for centerpiece. I do understand your love/hate feelings. I feel your pain, because those little critters do some great damage.Thank you. Yes, Liz was very sweet sending me those darling little pumpkins. Isn't the cake the cutest? We are safe, just very smoky here. It was such a terrible tragedy. I hope they find the missing people safe and sound. My hearts breaks for so many. Happy Thanksgiving Linda! 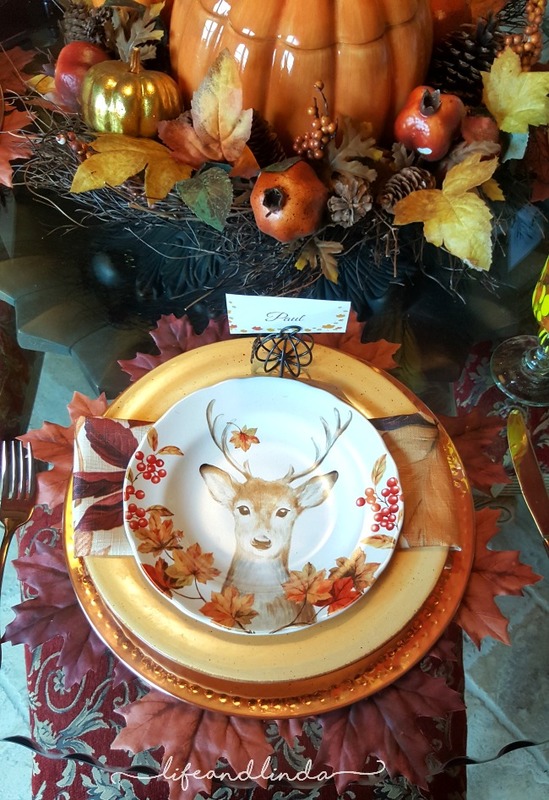 Super cute Forest Friends tablescape! Happy Thanksgiving to you and yours as well Monique. This is so cute Linda. 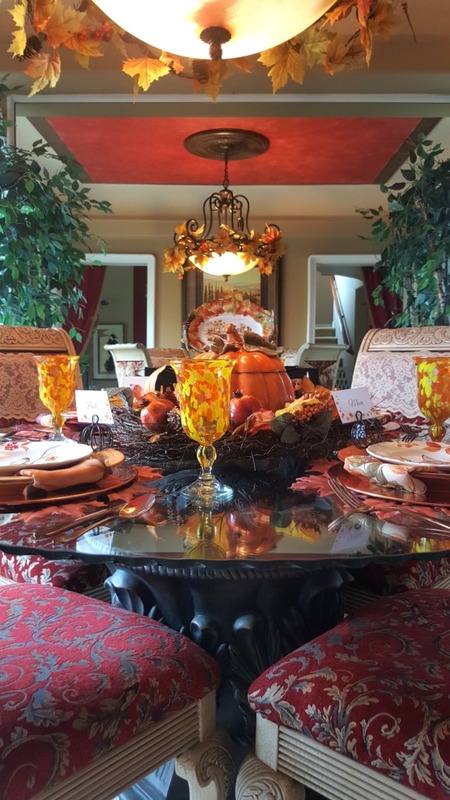 Love the dish pattern and the centerpiece. The wreath couldn't be more perfect for the tureen! So glad I could send you those little pumpkin place card holders! Wishing you a blessed Thanksgiving Day! Thank you Liz. I am very thankful for your friendship. The little pumpkin place card holders have come in handy. Oh, your plates are adorable! I love how you nestled your pumpkin tureen in the twig wreath - it looks as though it is nesting there for the cold months ahead. Your squirrels look happy with all the acorns to nibble on. 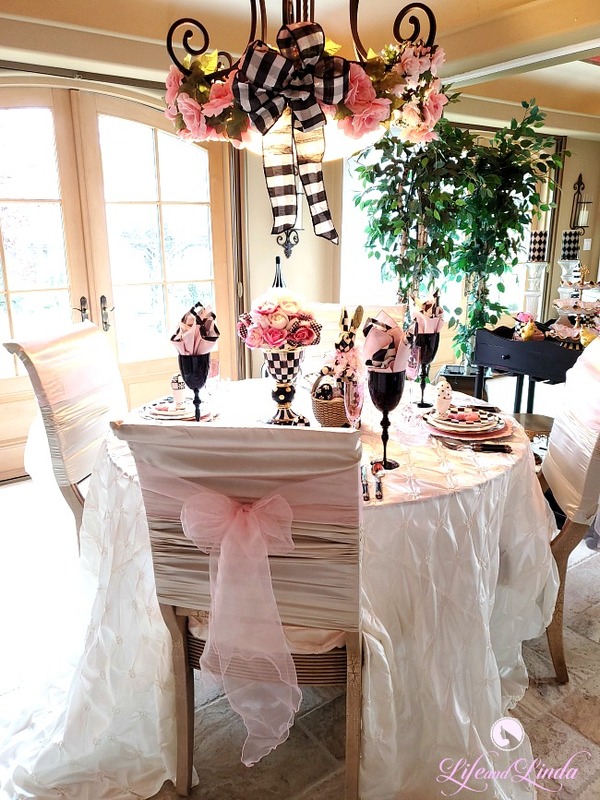 You have created a fun and colorful setting with your chandelier decorated as well. I hope you have a wonderful Thanksgiving!! Thanks Ann. I do love using the squirrels and dressing our chandelier. Happy Thanksgiving. Linda... your table looks gorgeous. I love all the festive detail. I am sending a friend your way for blog design. She is a local TV celeb. I so appreciate your sweet compliment. 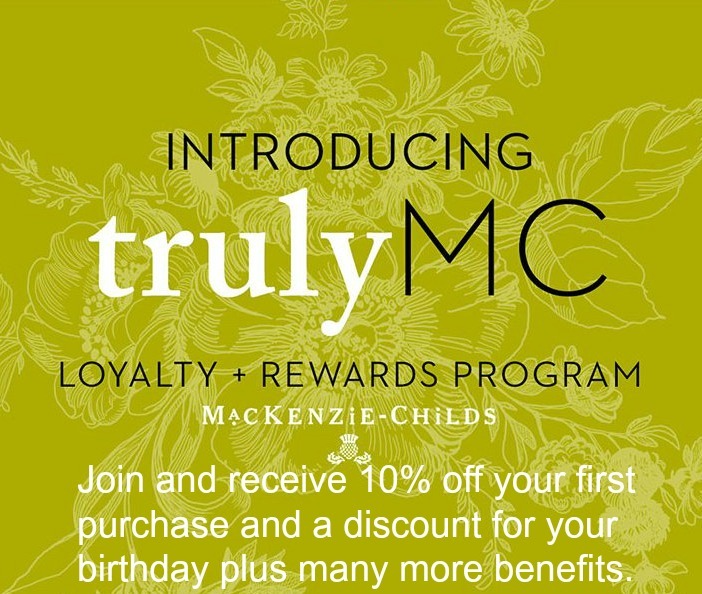 Thanks so much for referring possibly another client. 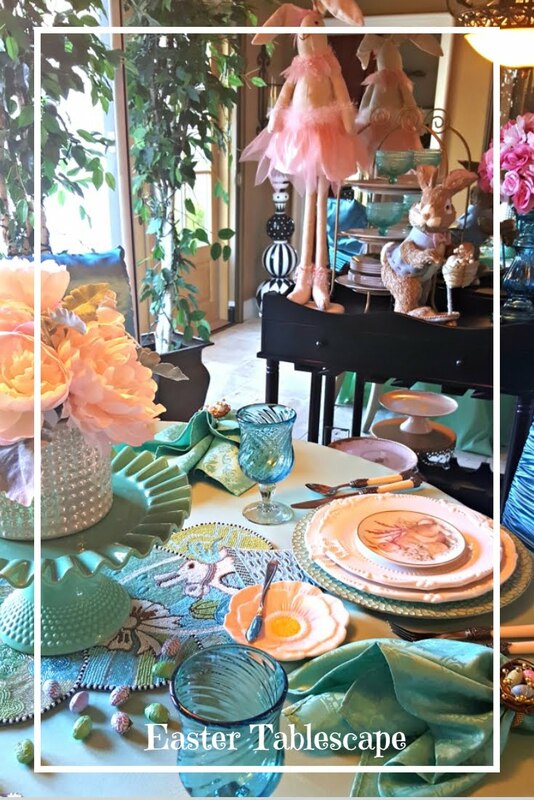 Linda, I love your woodland creatures that adorn your table creating fun and whimsy. Your tureen dressed with a wreath is the perfect centerpiece. What a sweet gift from Liz, and they are a wonderful addition to your table! Wishing you and yours a wonderful Thanksgiving and it is always a pleasure to blog hop with you! The woodland creatures plates are adorable as are the others. I can imagine how our little grandson's eyes would light up if he say these. Your traditional color palette is warm and inviting and I look forward to making that cake next year. Linda, your forest friends table is so pretty! I have similar salad plates and each time I look at your cute little animal faces, I can't help but smile. 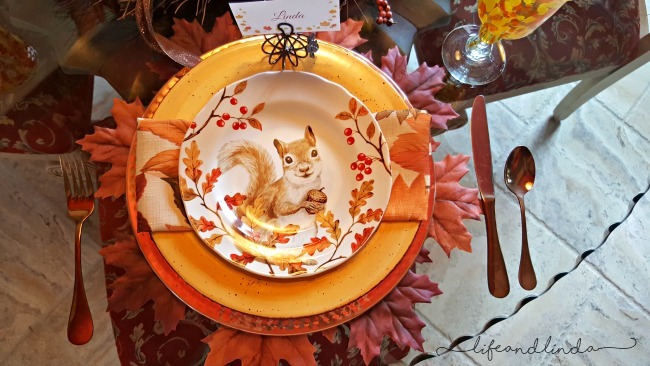 How clever of you to set up a little vignette of squirrels with acorns all around them as it adds to your tablescape theme and I have to agree that "those" little critters can be cute or a nuisance. I may smile at their antics at times, but in the back of my mind I am thinking how much like a rat they are and I certainly do not like rats. LOL Of course I feel the same way about the Tom & Jerry Cartoons too. Mice are only adorable in cartoon form. 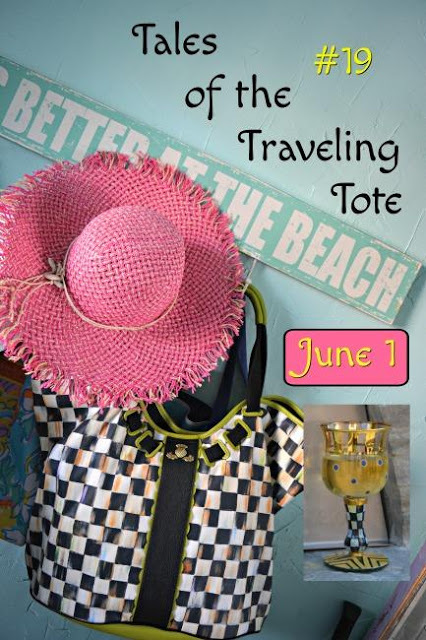 Thank you for your inspiration at this blog hop and all the others we have participated in together. Happy Thanksgiving from our home to yours. OOOOOOOOh Linda, I LOVE everything about this table. And those adorable critter plates are sooooo cute. Have a Happy Thanksgiving. 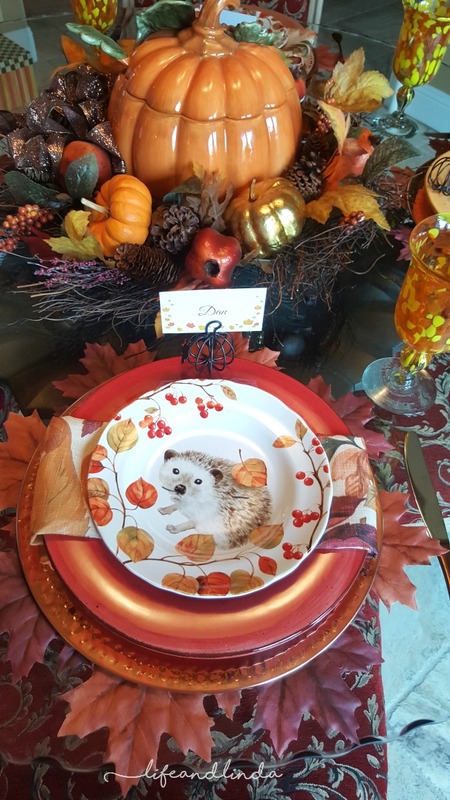 Those woodland creature plates are adorable and nestled around the pumpkin tureen and wreath are stunning. Warm fall colors and textures make me want to pull up a chair and have a long chat. I agree the place card holders were perfect for your table. And that cute cake was a great addition to your post. Enjoy blog hopping with you. You have been busy with back to back Thanksgiving hops! That cake is adorable. Love your cute tablescape. Happy Thanksgiving. I love those cute animal plates. 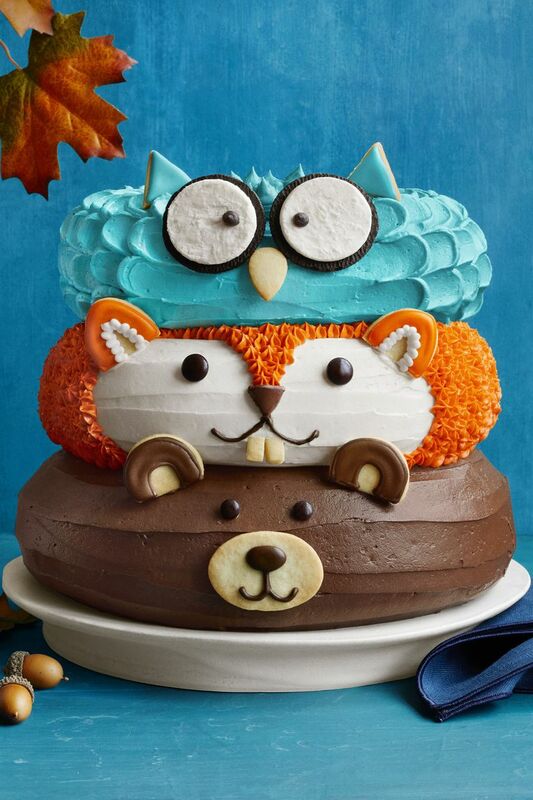 And the Forestfriends-Cake looks so funny and delicious! sending much Love and hugs to you, dear friend! Those plates are just too, too cute, Linda! They would've been hard for me to resist, too. Your table looks so pretty, as always. The cake is adorable, and would be a fun project. Hey Linda! Those plates are absolutely adorable. I wouldn't have been able to pass them up either. Those placecard holders are so cute! And I love your tureen centerpiece! So happy to be hopping with you! The woodland creature plates are too cute! 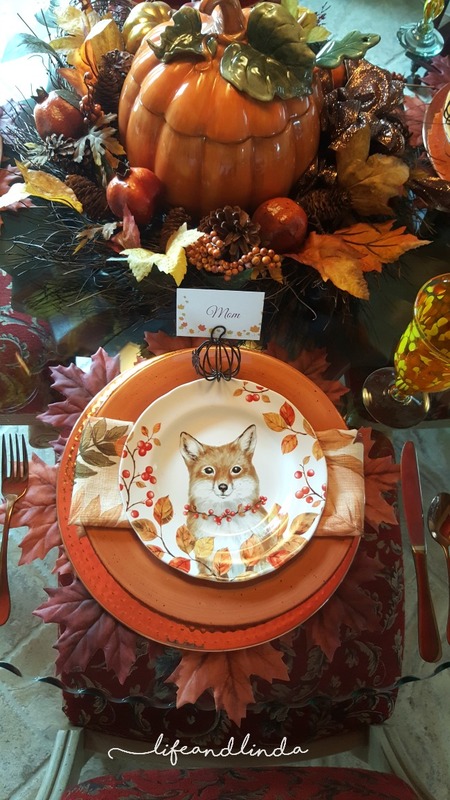 It's a wonderful place setting - perfect for fall and Thanksgiving. 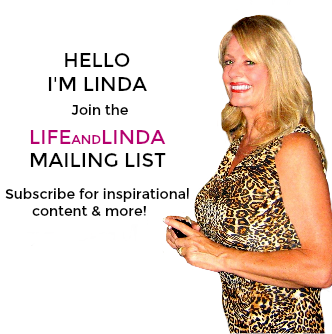 Such a sweet setting, Linda! I love the leaves peeking out in the lighting above and of course, your woodland friends are adorable. I also like the way you've wrapped your napkins - very unique. 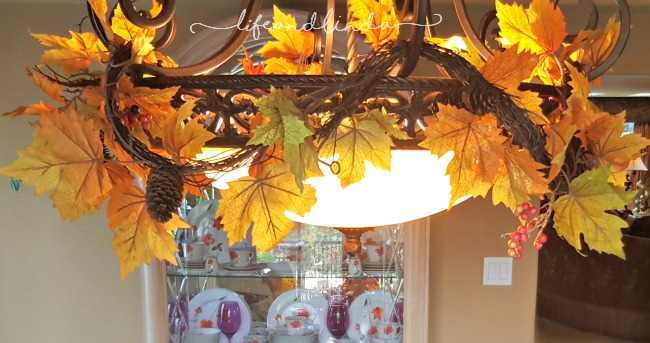 Perfect for not only Fall, but Thanksgiving as well! Happy Thanksgiving to you and yours! Linda, the woodland animal plates are so cute!! 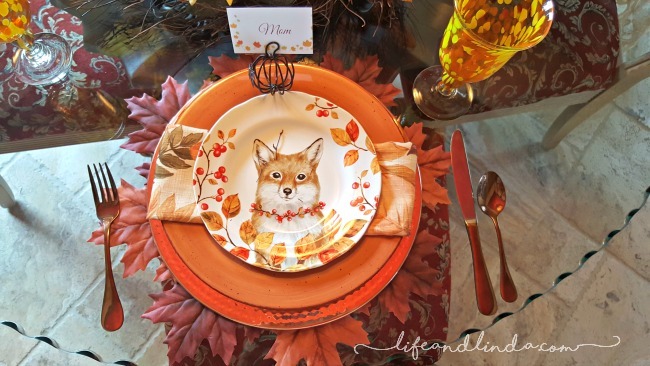 The perfect dishware for fall and Thanksgiving. I love the placecards and the pretty candles in the center of the table. Your table will be beautiful on Thanksgiving Day.